The One With the Engagement Party is a fun novella about a group of friends and their love lives. Nora and Harry are very much in love. They'd been friends for a long time when they finally realized there was more and now they are ready to take the next step. It was fun to take a peek in the lives of the bride-to-be and the friends she has chosen to be her bridesmaids. They solve problems, think about their own love lives and are trying to get used to the new situation. I had the idea that I got random peeks into their world and liked that very much. Erin Lawless gives her readers glimpses of their personalities, their relations to one another and their secrets. I immediately loved reading about this great group of people and am curious to find out more. The One With the Engagement Party is an unusual and creative story. I think the idea of following several main characters is great and I enjoyed reading about their emotions, perceptions and thoughts about one another. I didn't want this novella to end and I already look forward to reading more. 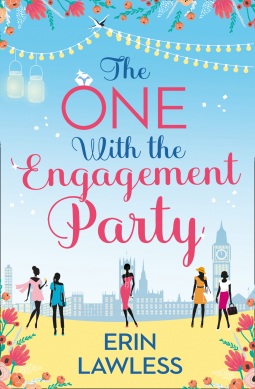 Engagement parties, dress shopping and wedding planning are things I love to read about, so this series is exactly my cup of tea. I love the sound of this book as it sounds different. Great cover as well. You posts are always dangerous for me. I always end up buying the book! Ha Ha. Wedding stories are so entertaining! I would love this! I like that this story follows each of the characters.